Fear the Walking Dead just aired its midseason finale, but when will the show be back? Today, AMC announced season three of the TV series will return in September. A spin-off of The Walking Dead, the action drama unfolds in Los Angeles and Mexico and follows a dysfunctional group who must band together in the face of the coming Zombie Apocalypse. The cast includes Kim Dickens, Cliff Curtis, Frank Dillane, Alycia Debnam-Carey, Rubén Blades, Mercedes Mason, and Colman Domingo. Season three of Fear the Walking Dead returns to AMC on September 10th at 9 p.m. ET/PT. NEW YORK, NY – July 10, 2017 – AMC’s original series “Fear the Walking Dead,” will return for the second half of season three with two back-to-back episodes on Sunday, September 10th beginning at 9:00 p.m. ET/PT, as announced during last night’s “Talking Dead.” The second half will consist of eight episodes. 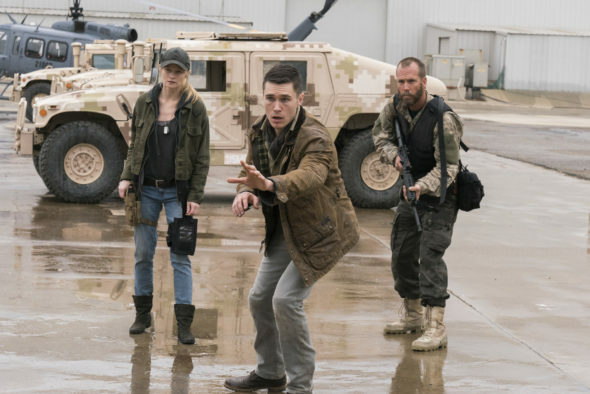 The #2 drama on cable, and #4 cable series overall, “Fear the Walking Dead,” is executive produced by Dave Erickson, Robert Kirkman, Gale Anne Hurd, Greg Nicotero and David Alpert. and produced by AMC Studios. What do you think? Do you watch Fear the Walking Dead? Are you excited for season three to return? I swear if FTWD and TWD get cancelled I will personally remove AMC from my tv programming to protest. We live for these 2 programs.